From Darcy to Dionysus: Newhailes: "the most learned room in Europe"
Newhailes: "the most learned room in Europe"
I'm pleased to share some more pictures from my local source of inspiration, Newhailes, the former home of the Dalrymple family which now lies in the hands of the National Trust for Scotland. The Newhailes Library collection was given to the National Libraries of Scotland in 1978 in lieu of death duties. 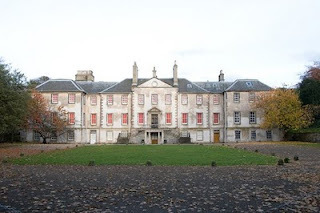 Together with manuscripts also acquired from Newhailes House, it is the most important contemporary collection to survive from the Scottish Enlightenment. The collection consists of c. 7,000 volumes and a number of pamphlets, broadsheets, prints, maps and music; British and foreign works, of the 16th to the 18th century, with three incunables and some 19th century material (see website of the National Library of Scotland). Among the papers is the manuscript of Lord Hailes’s Annals of Scotland, annotated by Samuel Johnson, and letters of his contemporaries including Hume, Robertson, Beattie and Burke. Sir David's brother Alexander (1737-1808) was the first hydrographer to the Admiralty and a writer on geographical matters. The Newhailes Library collection also contains his private and East India Company charts, published between 1769-1786, as well as the books of his East Indies nautical memoirs. The spectacular oak-panelled library is itself fascinating. Added in the second decade of the 1700s, the two-story library was built to open from floor level out onto the Cabinet Garden, an architecturally cut clearing or room within the woods (pictured below). As an extension to the library, it was designed as a place for discussion and contemplation and is an example of the interweaving boundaries between the house and the landscape which is a theme throughout the estate. The Newhailes library provided a forum for key figures from the Scottish Enlightenment (1750-1800), such as David Hume and James Boswell. The interface between intellect, debate and the natural world was very much of its time and reflective of the politics and philosophy of the day. 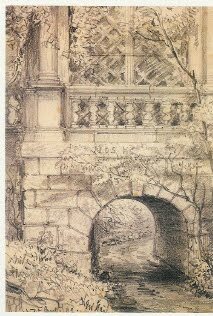 In the 18th Century, the concept of "Landscape" or "English" gardens was spreading across the continent, promoted by the philosophers and revolutionary thinkers of the 18th century. The Landscape garden, as epitomised by the work of Capability Brown, provided a naturalised, idealised look. This was a direct contrast to its predecessor - the garden "à la française" or French Classical style which was modelled on the symmetry and grandeur of Versailles and associated with autocracy and France's ancien regime. In the garden à la française man dominates nature, forcing rationality and authority upon the natural world and placing the house or palace at the centre. As absolutism became challenged, so too did the strict formality of the garden. The movement towards the natural, picturesque style represented rebellion against autocratic rule and a desire for natural freedom. Newhailes is an early example of the natural style from a transitional period: it references classical thought but also has the features of a Rococo garden: regular irregularity and architectural incident (such as the grotto and the Tea House) on a scale that is small rather than grand. 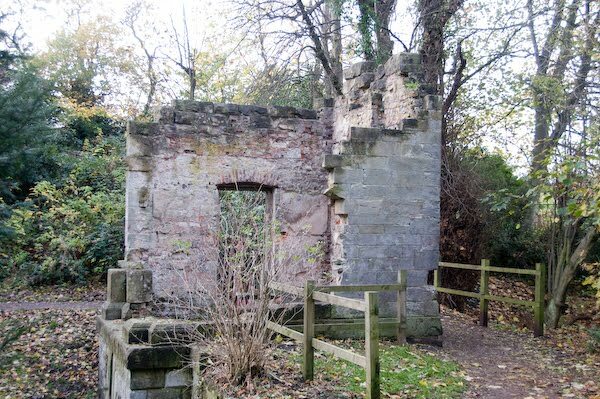 The mid-18th century Tea House was situated at the Northern extremity of the estate's water gardens and was designed as an eyecatching endpiece to the Newhailes stretch of Brunstane Burn. The Tea House is a contemporary copy of the famous Palladian Bridge built by the Earl of Pembroke at Wilton House, Wiltshire. 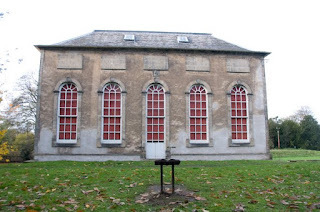 The Tea House exemplifies early-mid 18th-century neo-Augustan ideal. It is intended for quiet contemplation and bears the inscription "nos humilem", a reference to Horace "for my self, I will sacrifice a humble lamb...". 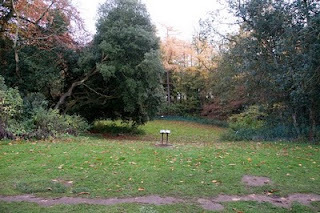 Information on the archaeology of the Tea House can be found here and an image of it as it once was is below. 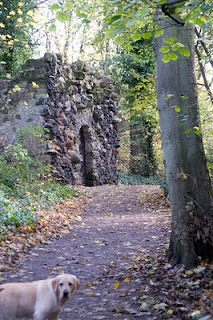 The other key feature of the water gardens is the Shell Grotto which I discuss more in my earlier post. THe interaction between the house and gardens at Newhailes helps to capture the atmosphere of a particularly fascinating period in our history: the birth of the modern world. In the 1700s the dominance of intellect and reason led to an explosion of scientific and economic progress, much of which was led by Scotland. In reaction, in the 1800s imagination, romance, creativity and the natural world became highly prized leading to the preeminence of the romantics in the visual and literary arts. The formal, splendid structure of 18th century costume with its towering hair and painted faces gives way to the soft, empire-style muslin robe and tumbling natural curls. Satire gives way to romance and nature is allowed to shine in the natural artifice of the landscape garden. This is a fertile environment to allow the imagination free reign. How exciting it must have been to have been privy to such intellectual progress and confusing it must have been for the autocrats of the early 1700s to understand the romantic inclinations of their children and grandchildren. Newhailes is a magnificent resource for anyone with an interest in this period - there will be more images to view in the next few weeks.